I suppose most people have returned to their normal life after the New Year’s holidays by now. 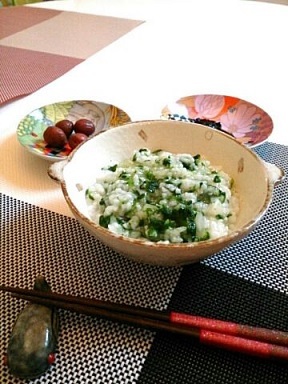 Yesterday was a “Jinjitsu no sekku” (sekku = seasonal festival), so many of you might have eaten “Nanakusa gayu”. I also had “Nanakusa gayu” with my family, so that we can spend the new year in good health. I believe preparing to follow such traditional and seasonal ritual gives us a good opportunity to think about our past or future in our busy everyday life. Wishing you all a great health!